Arrive at the Studio on Wednesday afternoon for the introductory get together and then spend the next three and a half days immersed in the session workshop in my knitting/teaching Studio in the historic Highlands district of Denver, Colorado. I like to think of the Studio as a playhouse for knitters. There's the yarn room, the knitting library, our "snack time central" kitchen, and the meeting room where we will be sharing and exploring techniques all in one cozy place. 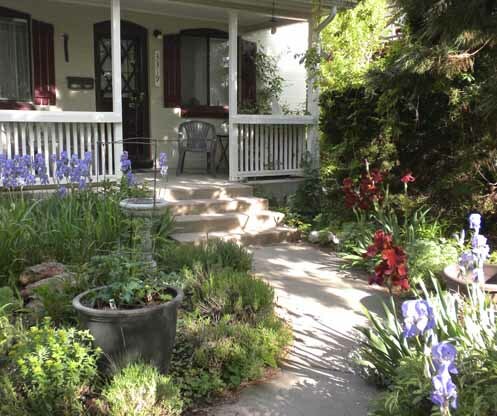 With a knitting nest around your chair, a front porch and flower garden to enjoy, and an historic neighborhood to explore, you'll feel right at home. Spring and fall we have different topics and each workshop includes the premier of a new design, You'll receive the pattern and lots of extra information about it as part of the workshop and your Knitaway® package. Mornings are devoted to the workshop topic and after lunching at one of the many wonderful neighborhood eateries, we keep on knitting with lots of time for you to request a tutorial, work on your class project, ask knitting questions or get personalized answers for your projects. Knitters of all levels are welcome and sharing is encouraged. The workshop size is limited to 7 knitters so there will be plenty of individual attention. 2014 Knitaway® in the Studio tuition, including over 20 hours of workshop and opening/closing get togethers, is $385 per person. If you are coming from out of town, there are great hotels within a few miles of the Studio ranging from the Hampton Inn to the Ritz Carlton (really!) and many lovely places in between. A list of lodging, dining, and entertainment suggestions will be provided with registration confirmation. The Studio is nestled in the Highlands historic district, a wonderful neighborhood to explore with popular shops and restaurants within easy walking distance. May and October are both gorgeous times of the year in Colorado and you might want to extend your stay to enjoy a day in the mountains or take in the Denver Art Museum. And don't forget that we have several beautiful yarn shops in the metro area! We will be visiting a few of my favorites on a yarn outing. Knitaway® in the Studio tuition is $385 and is due with your registration. Click here to print the Registration Form, fill it out and return with your tuition payment. Please note that tuition must be paid by check only and registrations are accepted only through the mail. If you cancel at least one month in advance, a refund of all but $95.00 can be arranged if there is a replacement for you. Waiting lists are maintained for sold out sessions. Do you have a group of knitting friends that want to come to the Knitaway® but the dates don't work? Private sessions can be arranged for groups of 3-7. Contact me for more information.